I jazzed it up and personalized it with shapes, numbers and his name I cut from scraps of vinyl left over from other projects. 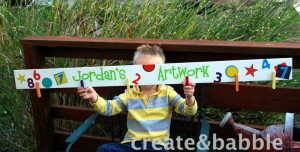 You could also use stencils or stickers. Have fun and get creative with this! I attached the clothespins with E6000 glue. Hot glue or Gorilla Glue would probably work also. 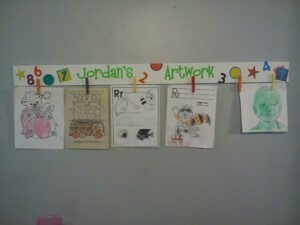 So for about six dollars and about an hour’s time my grandson has a colorful artwork display that he loves. His mom told me that the first thing he does when he comes home from school is run to his artwork board to hang up his papers (I mean his works of art! ).